The resilience training program in this workbook was developed by the authors at one of the foremost integrative medical centers in the country, the University of Minnesota Center for Spirituality and Healing. Based on principles first introduced in The Chemistry of Joy, The Chemistry of Joy Workbook blends integrative psychiatry, nutrition, fitness, meditation, guidance for mindful living, and the psychology of mindfulness to help readers overcome the three main forms of depression and balance their brain chemistry for greater motivation and happiness. This workbook reframes depression as a breakdown of the readers' natural resilient state and offers a comprehensive training program rebuilding resilience, connection with others, and joy. The program consists of ten stages, which can be completed in ten weeks. Questionnaires, exercises, and practices throughout help readers guide themselves through the program and stay motivated to change. "With extensive questionnaires, case examples, and individualized solutions covering all bases, this user-friendly workbook provides scientifically based recommendations for helping you reconnect with the joy that is your birthright. Just read and apply it--you will be happy you did!" --Hyla Cass, MD, author of Eight Weeks to Vibrant Health "This workbook is a true lifeline. Follow its clear, engaging, expertly designed steps and you'll experience healing and thriving like never before." --Raphael Cushnir, author of The One Thing Holding You Back "The Chemistry of Joy Workbook gently, lovingly, and assuredly offers us the tools to reach the oasis of serenity we all seek, providing each of us with the opportunity to experience the best of what life has to offer." --David Perlmutter, MD, FACN, ABIHM, author of Power Up Your Brain "Many great wisdom traditions tell us that joy and happiness are not conditions that have to be created anew, but are natural and innate in everyone. Our task is to remove the obstructions that prevent us from realizing the inherent delight of life. 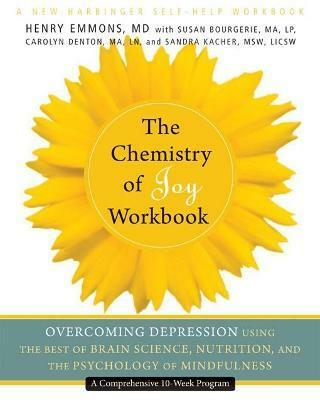 The Chemistry of Joy Workbook is a marvelous tool that can help anyone accomplish this." --Larry Dossey, MD, author of The Power of Premonitions and Reinventing Medicine "This book offers a brilliant new analysis of depression as a breakdown of positive mental and physical factors, and then gives readers a powerful toolbox of methods for restoring these factors in mind, heart, and body. Grounded in science, eminently practical, focused on the positive, and full of heart, this is a great resource for feeling better and for increasing the inner strength and resilience that will prevent depressed moods in the first place." --Rick Hanson, PhD, author of Buddha's Brain and Just One Thing "Depressed? Anxious? Before you reach for a prescription, reach for The Chemistry of Joy Workbook and follow the instructions. This book is the answer and I highly recommend it!" --Christiane Northrup, MD, ob/gyn physician and author of the New York Times bestsellers Women's Bodies, Women's Wisdom and The Wisdom of Menopause "A needed synthesis for people who need a balanced approach that incorporates the best wisdom of modern psychiatry and alternative medicine. This book communicates the science of brain chemistry in a straightforward manner, explaining the medical treatment of depression in plain English for the many people who want to understand the suffering inside them. I especially appreciate the compassion and the depth of experience that informs this useful book, from beginning to end. It is a work of great expertise and great love." --Mary Hayes Grieco, director of The Midwest Institute for Forgiveness Training and author of Unconditional Forgiveness "This is a workbook that actually works! It provides an excellent set of self-assessment tools that can help you better understand yourself and the causes of any psychological challenges you may be experiencing. It's practical and easy to understand, and it offers the opportunity for genuine insight." --Phillip Moffitt, founder of the Life Balance Institute and author of Emotional Chaos to Clarity and Dancing with Life "The Chemistry of Joy Workbook provides a wealth of practical information and advice for anyone who struggles with depression. Using readily available therapies and simple instructions, the expert authors offer a comprehensive self-care plan that addresses the causes of depression at the levels of body, mind, and spirit." Susan Bourgerie, MA, LP, is an experienced psychotherapist and cofounder of Loring Psychotherapy and Mindfulness Center in Minneapolis, MN. She is part of the team delivering the resilience training program offered at the Penny George Institute for Health and Healing. Carolyn Denton, MA, LN, is an integrative nutritionist who focuses not only on general health and disease prevention, but also nutrition as a complementary therapy for chronic and degenerative diseases. She is a member of the integrative medicine team at the Penny George Institute for Health and Healing. Sandra Kacher, MSW, LICSW, has over twenty-five years of clinical experience and is cofounder of Loring Psychotherapy and Mindfulness Center. She is a founding team member of the resilience training program at the Penny George Institute for Health and Healing.